For the final assignment, you will develop a project using a combination of digital and traditional fabrication methods that critically analyzes the current landscape of consumer digital fabrication. You will creatively solve a design challenge of your choice through the use of 3D Printing or Laser Cutting by developing a digital object and disseminating it as an open source project online. Do you wear make-up? 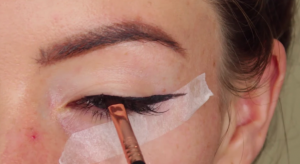 Do you struggle with applying eye-liner? Fear not! The BullsEyeliner is here! On my way home from last week’s class I began to brainstorm about my third assignment and the design challenge I would solve. Since I started taking this course, my eyes have opened up to the world of fabrication and I am thinking differently about design challenges. For instance, in my Master’s class I have been seeing new ways to design way-finding systems for low-vision people that can be understood and useful to everyone. Although tactile systems have proven to be helpful for a variety of users such as the blind, using scent, touch, sound and even taste to navigate is a very niche idea that begs to be further explored. For assignment 3, I wanted it to be more creative than complex and focus on creating an object that was more useful that unique. During my commute I saw the familiar sight of a young woman applying her make-up on the train. Women are known to be excellent multi-taskers, but juggling many tasks and applying eye-liner with acute precision do not go hand in hand. Over the weekend I curated a dance show. While there, I saw my colleagues apply eye-shadow, mascara, eye-liner with intense focus and stillness. Everyone who wears makeup knows that messing up your eye-liner is almost expected. The smudging, the shorter/longer or thinner/thicker eye, the tears…The rare times you get both sides evenly drawn out, you smile from ear to ear with triumph! I realized that this, a routine that some women practice everyday, was a design problem that needed fixing! 4. 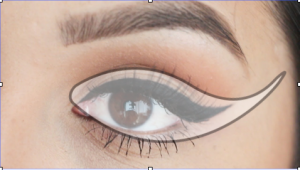 I used my outline in combination with “perfect” eyeliner images to develop a smoother image for cutting. 6. Then I acquired the thinnest polycarbonate plastic I could find in the plastic department as well as a piece of foam for additional support on the back of the stencil. loaded my materials account and sent my image in for cutting! The first time around, I completely forgot to adjust the size to a normal eye size so I had to cut again. How will the end user interact with the project, using their own tools perhaps located on a different continent? Anyone can cut and use the Bullseyeliner with the right materials. They would require a bendable material, soft foam or felt, a computer and a laser cutting machine. What considerations must be made to ensure the accurate recreation of your product? Is that even possible? What complex challenges arise when the designer is no longer in control of the design in question? The drawing was based off of the outlines of the images of various different eye shapes and aims to encapsulate the general curves in the average eye. 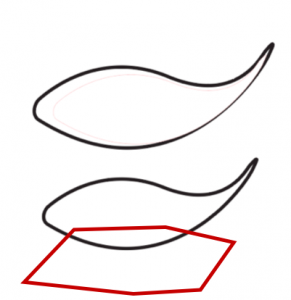 The user is free to adjust the lines to better suit their curves but the template should work on any eye-shape. What makes this product unique is that it is allowed to be altered and adjusted to better suit the consumer. What if the person has body dysmorphia in the eye region? If they were able to re-design the Bullseyeliner in a way that is ideal to them, my hope is they could find a way to get that perfect line everytime! What critical component does digital fabrication address that could not be achieved with traditional fabrication methods? The beauty of digital fabrication methods lies in the technology. One that allows the designer and/or user to alter, recreate and rethink past iterations and prototypes. Traditional fabrication methods are far more permanent and usually must begin from scratch to achieve the desired outcome. Digital fabrication also allows the designer to create multiple versions of the same work with a precision not possible in man-made creations. The exact lines, even depth and razor sharp measurements make digital fabrication methods much more reliable for mass-production and mass-replication.